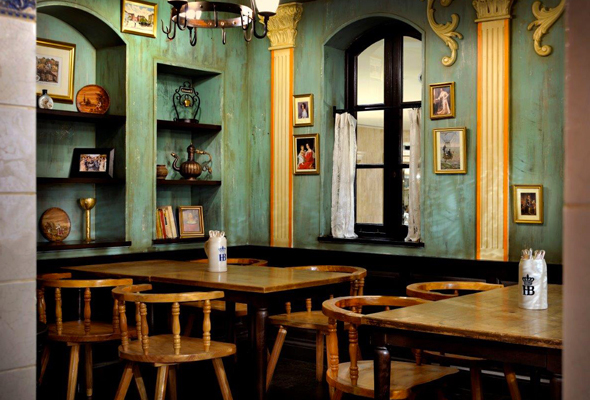 It’s all about hearty Bavarian food, German brews and a laidback atmosphere at Hofbräuhaus. The place is kitted out just like the original Hofbräuhaus in Munich – which is one of the city’s most famous watering holes. The traditional venue was built in 1589, and although the Dubai outpost doesn’t have the same history, it makes up for it by recreating the atmosphere and wholesome food. The Bavarian Extravaganza promotion is the perfect way to line your stomach, with an authentic feast of traditional German dishes for just Dhs99. The homely spread is available on Thursdays and Fridays from 7pm until 11.30pm, making it an ideal way to unwind at the weekend. It’s not all about the end of the week though – from Sunday to Thursday you’ll find co-workers and groups of friends mingling while tucking into the casual but tasty menu. Think sauerkraut and white sausage with sweet mustard for your main, and a warm plate of strudel for dessert. And the Munich vibes don’t stop there. The staff are dressed in Bavarian outfits, and are ready to get the atmosphere going. Top it all off with some accordion music in the background and you’ve got a recipe for the perfect “ausgehabend” – that’s German for night out, by the way!